Panzerkampfwagen VI ausf E Tiger turmnummer (turret number) 112 of Schwere Panzer Abteliung (Heavy Tank Battalion) 501, 1.Kompanie, 1.Zug (Platoon), second vehicle, on a road march in Tunisia. The tank is fitted with combat tracks so it is close to the front, but since the protective cover is on the muzzle brake, it is not expecting action. This tank, Fahrgestell (Hull Number) 250012, was the eleventh production Tiger delivered in October 1942 and has the original gun mantlet, commander's cupola and sectional track guards. The headlights have ben moved from the top of the chassis to mountings on the front hull. Schwere Panzer 501 was ordered by Reichsklanzer (Reichchancellor) Adolf Hitler to join General Erwin Rommel's Panzer Armee Afrika in Tunisia as a response to the Allied Operation Torch, the landings in Morocco and Algeria on November 8, 1942. The Germans were able to move Panzer Abteilung 501 unmolested by sea or air from Italy to Tunisia. Tiger 112 was the third of three heavy tanks to be unloaded in Bizerte on November 23. Hauptmann (Captain) Nikolai Freiherr ("Free Lord" translated as Baron) von Nolde was the Battalion Commander. He was famous in the Battalion for wearing tennis shoes in combat. The Battalion also had Panzer III ausf N (with a short-barrelled 75mm gun) for reconnaissance and to suppress infantry. The first combat action for tiger 112 was on December 1, when the three Tigers and four Panzer IIIs engaged British forces in Tebourba; Von Nolde was killed when his legs were torn away by an anti-tank round, his tennis shoes with them. Oberleutnant Deichmann took over but was soon killed by a British sniper. The American 1st Armored Division, supporting the British 2,000 yards (1828 meters) away at Djedeida, lost nine tanks. Tebourba was captured on December 4 when the Germans employed Junkers Stuka diver bombers in a supporting role. In early January 1943, eight Tigers of 2.Kompanie, which were employed in the occupation of Vichy France, are landed in Tunisia. The Battalion participated in the Battles around Kasserine Pass in February 1943. 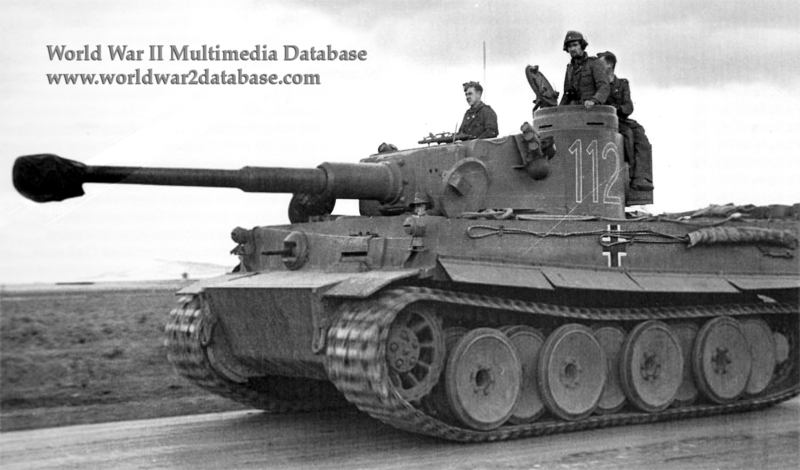 On March 17, 1943, the remaining eleven Tigers were transferred to the newly arrived Schwere Panzer Abteilung 504. The fate of Tiger 112 is confusing; it survived until Abteilung 504 took it over, where it received a new turmnummer. Parts of the Tiger were used to repair Fahrgestell 250031 after the surrender of all Axis forces in North Africa on May 12. Tiger 250031 was shipped to Aberdeen Proving Grounds, and decades later to England and Sinsheim Technical Museum in Germany before returning to the United States. 250031 is often incorrectly labeled as 250012 because of serial numbers on parts from that Tiger I.